Fantastic Four Slots is an amazing 5 reel 25 paylines online video slot machine with 5 free spins bonus games, 3 progressive jackpots and many other intriguing features. It was released in May, 2009 by Cryptologic exploding the market with its fantastic bonuses. The game keeps on winning fans’ hearts till the moment. Modern technologies of Cryptologic allow you to join the world of favorite heroes both in no download and installation versions. The game is based on a famous Fantastic Four comics series by Marvel. Our favorite heroes possessing supernatural power now fight against Dr. Doom to win the treasures he keeps in stock for destroying the world. The top goal of the team is to win all savings of the evil enemy, top jackpot of 5,000 coins of $25,000 inclusive. To get some serious sums besides the enormous jackpot, you are offered a series of free spins Bonus Games played on the reels. You can select from several free spins modes, and choose your best variant for winning more coins. Interesting featured icons and window design make the game really exciting, and help you to feel like a part of the famous heroes’ world with all its miracles. A range of animated symbols and decent sounds make Fantastic Four Slots more lively for you not to get bored while playing. 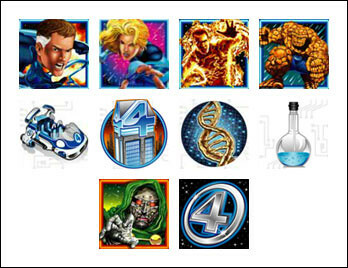 To help the fantastic four make all 28 winning combinations available in the game, you need to strike the following symbols appearing on the reels: Mr. Fantastic, Invisible Woman, Human Torch, The Thing, Dr. Doom, DNA Molecule, Flask, Baxter Building, Fantastic Four Car, and Fantastic Four Logo. Besides the famous heroes you can also hit Nine, Ten, Jack, Queen, King and Ace symbols helping you to win even more exciting sums. In Fantastic Four Slots you can find a good choice of coin sizes varying between $0.01 and $5. Here is the full list of available coins: $0.01, $0.02, $0.03, $0.04, $0.05, $0.10, $0.15, $0.20, $0.25, $0.50, $0.75, $1, $2, $3, $4, $5. With this choice you can change the bet size all the time playing with your luck. If you like to bet the maximum, in Fantastic Four Slots you can stake up to $125 per spin. If you are a careful player, instead, you can put $0.01-$0.25 at stake: it depends only on the number of lines you choose. The game is balanced so well that both small and big bets have good chances for winning. The highest jackpot is 5,000 coins or $25,000 for 5 Mr. Fantastic, Invisible Woman, Human Torch, The Thing or Dr. Doom wild symbols. The second jackpot is 1,500 coins or $7,500 for 5 DNA Molecule symbols. The third highest jackpot is 1,000 coins or $5,000 for 4 Mr. Fantastic, Invisible Woman, Human Torch, The Thing or Dr. Doom wild symbols. In this slots machine you can strike up to 5 wild symbols appearing on the reels. Mr. Fantastic, Invisible Woman, Human Torch, The Thing or Dr. Doom wild symbols appear on reels 1, 2, 3, 4, 5, respectively, and substitute for any other symbol except the scatter icon of Fantastic Four Logo. The game suggests you to make winning combinations even if the symbols do not match on the reels. For this you can hit two or more Fantastic Four Logo scatter symbols. If 2, 3, 4 or 5 these icons appear scattered on the reels, the sum of your total bet goes multiplied by 2, 5, 20 and 100, respectively. The incredible multipliers allow you to win up to $125,000 if you strike five scatter symbols with the total bet of $1,250. Also, three or more scatter icons activate a bonus game. Free Spins. 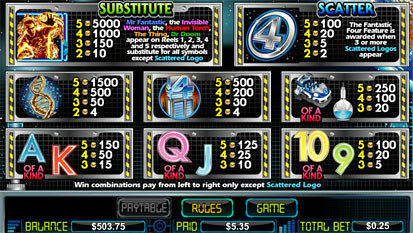 The bonus game in Fantastic Four Slots is triggered by three or more scatter symbols appearing on the reels at once. In this mode one can win free spins. An outstanding feature of this slots game is that it is possible to select from 5 bonus modes with different intriguing options suggested. These 5 games include up to 15 Free Spins, 2-10 multipliers, and a special option for every mode. The maximal winning in this free spins bonus game is the huge sum of $250,000 if you strike 5 wild symbols with the highest 10x multiplier. None of the options allows you to retrigger the free spins. This game was developed in cooperation between Cryptologic and Marvel, so like in all Marvel featured slots, you can hit three progressive jackpots. These jackpots are Marvel Hero Jackpot, Super Hero Jackpot and Hero Jackpot. All of them are awarded to a random player in game approximately once in a couple of hours. But if you want to increase your chances for winning these fantastic sums it is necessary to bet more. Also, these jackpots don’t require any combination hit on the reels. 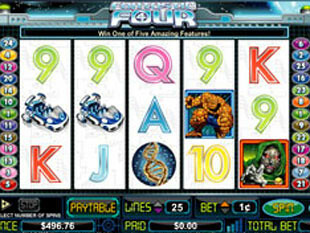 Fantastic Four slot machine is an intriguing featured game letting you merge into the fabulous world of heroes dating back to the happy days of our childhood. The game allows you to chose from a wide range of bets, to play 5 different free spins bonus modes and to win up to three progressive jackpots with unbelievable sums.